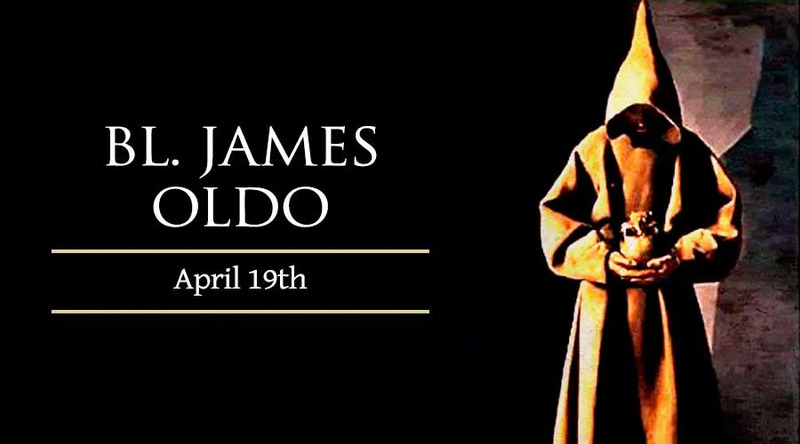 James Oldo experienced a radical conversion that led him to become a Franciscan tertiary, and later a priest. He was born in 1364 into a rich family in Lodi, Italy. He married at a young age, and he and his wife both led a very self-indulgent lifesyle. One day, a traveling reproduction of the Holy Sepulchre came to thier town. As a joke, James lay down on it to compare his height to Christ's. As soon as he laid down on it, he was instantly converted, and became a tertiary soon after. At first, his mother and wife were opposed to the change they saw in him, but soon they grew attracted to his new ways and became tertiaries as well. The family turned their mansion into a chapel and worked with the sick and with prisoners. When James’ wife died, he became a priest. His acts of penance were so severe that his bishop had to order him to eat at least three times a week. He was a celebrated preacher, who inspired many to enter the religious life. He also prophesied wars and his own death. He died at the age of 40 in 1404. When his body was moved seven years after his death, it was found incorrupt.